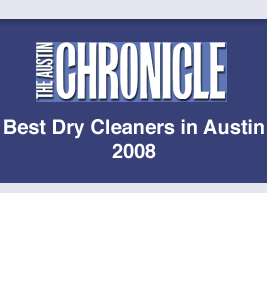 There are hundreds of dry cleaners in the Downtown and Northwest Austin area all claiming to offer something different or special. At Cathy’s we strive to have you see and experience the difference. Cathy’s has been in service for over 25 years in Austin and have earned the trust of Austin residents. At Cathy’s we just don’t talk about quality we delivery it. Quality can mean a lot of things to a lot of people. We believe that quality starts with the second you walk in the door. From a friendly hello to quick and courteous service it’s all part of the quality we strive to deliver. Of course, we are focused on getting your garments and clothing clean and pressed to perfection but we don’t overlook that he has to be included in the "package" of service and ease you demand. It all starts with trust at Cathy’s! Cathy’s is keenly aware that you work hard for your money and your clothes. Trusting us to protect, clean and preserve those fine treasures is not a burden but an HONOR. Most have had the experience of a cleaner misplacing or losing your garments. You are the, the customer, is the single reason we are in business thus, at Cathy’s goes the extra mile to make sure that your garments are not lost, misplaced or mishandled. Cathy’s strives to earn your trust and keep it. In today’s world of hyper marketing, soccer games, birthday parties and work there is little time left for the day-to-day errands. Furthermore, there is little time for laundry, pressing and folding. Cathy’s will give you back some of your most precious resource...your time. Cathy’s will process your order quickly and have you back on the road in no time. Looking your best takes time, at Cathy’s we don’t think it should take all of it. Hang Nguyen email (hang.nguyen@cathyscleaners.net) as the contact for 231 W. 3rd Street and 1100 E. Cesar Chavez. 2006 Cathy's Cleaners. All rights reserved.